Intrepid travellers will find Chad's Ennedi plateau in the middle of the Sahara Desert. Scenically, the area is a magnificent mix of lakes, golden sand, mysterious canyons and bizarre rock formations. Visitors will even find some prehistoric rock paintings. 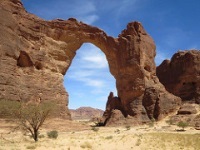 Photographers will relish Ennedi's natural sandstone arches. The Aloba Arch is particularly striking, along with being one of the largest of its kind in the world. The plateau's pools and rivers also attract some unusual animals, including the nearly extinct desert crocodile. Guelta d'Archei is probably the most well-known oasis in Ennedi. Travellers can access the plateau through the small airport in Fada, the region's capital. Beyond that, banditry and a lack of infrastructure make navigating the area difficult.